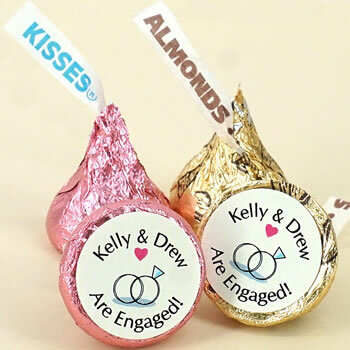 Charming and romantic, the heart themed Hershey Kiss wedding favors will make your guests smile, as the Hershey Kiss has done since 1907. These classic kisses have an innovative twist with five different heart designs and your names on each of these unique wedding favors. The bright silver foil is a wonderful accent to any decor. Sprinkle them on guests' tables or place them in bowls, but make sure you have plenty, because one kiss is never enough! Nice Price Favors will not be responsible for any melted chocolate if 2-day shipping and insulated packaging are not chosen. Unfortunately, the chocolates were melted so I wasted the money. There was only one ice pack included but since I did not choose the fastest delivery, it was not enough. Would not recommend during the summer months. The kisses were very cute and tastey too!